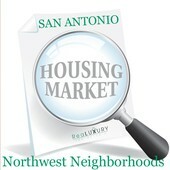 Here is Part 2 of the Fourth Quarter Housing Update -- this time focusing on San Antonio's northwest neighborhoods -- including a few north central neighborhoods, too. Comparing data from January -December 2013 and January-December 2014 from the Texas Association of Realtors, here is a snapshot of what is happening in some of San Antonio's most sought after northwest neighborhoods. The median home price in Castle Hills decreased from $250,250 to $238,000, with 53 homes sold in 2014. Homes for sale in Castle Hills were on the market 25 more days compared to last year. The housing inventory decreased from 6.5 months to 2.8 months. Click here to see all the homes for sale now in Castle Hills. Click here to see all the homes for sale now in Elm Creek. The median home price in Deerfield increased from $330,000 to $350,750, with 52 homes sold in 2014. Homes for sale in Deerfield were on the market 9 days longer compared with last year. The housing inventory increased from 6.5 months to 7 months. Click here to see all the homes for sale in Deerfield. Click here to see all the homes for sale in Inwood. The median home price in Stone Oak increased from $280,000 to $295,000 with 877 homes sold in zip code 78258 in 2014. Homes for sale in the Heights of Stone Oak were on the market 7 fewer days compared last year. The housing inventory shrank from 3.9 months to 3.1 months. Click here to see all the homes for sale Stone Oak (zip code 78258). The median home price in Rogers Ranch rose from $387,000 to $401,200 with 109 homes sold in 2014. Homes for sale in Rogers Ranch were on the market 24 fewer days compared with last year. The housing inventory shrank from 6.5 months to 4.4 months. Click here to see all the homes for sale now in Rogers Ranch. The median home price in Hollywood Park decreased from $293,000 to $274,950 with 64 homes sold in 2014. Homes for sale in Hollywood Park were on the market 26 fewer days compared to last year. The housing inventory decreased from 2.5 months to 1 month. Click here to see all the homes for sale now in Hollywood Park. The median home price in the Dominion increased from $612,500 to $672,500, with 76 homes sold in 2014. Homes for sale in the Dominion were on the market 10 more days compared to last year. The housing inventory in the Dominion shrank from 18.6 months to 12.2 months. Click here to see all the homes for sale in the Dominion. The median home price in Fair Oaks Ranch decreased slightly from $415,000 to $414,250 with 180 homes sold in 2014. Homes for sale in Fair Oaks Ranch were on the market 37 fewer days compared with last year. The housing inventory in Fair Oaks Ranch rose from 7.6 months to 8 months. Click here to see all the homes for sale in Fair Oaks Ranch. The median home price in Helotes (zip code 78023) increased from $261,000 to $270,000 with 476 homes sold in 2014. Homes for sale in Helotes were on the market 8 fewer days compared with last year. The housing inventory shrank from 4.3 months to 3.7 months, keeping Helotes in a seller's market. The median home price in Boerne (zip code 78006) increased from $280,000 to $306,400 with 518 homes sold in 2014. Homes for sale in Boerne spent 5 fewer days on market compared with last year. The housing inventory shrank from 8.7 months to 6.7 months. Click here to see all the homes for sale now in Boerne (zip code 78006).